My best friend was now my deadliest enemy, the one person I'd hate beyond all measure for the rest of my life . . .
Franny Barker's best friend, Alice, is the worst girlfriend in the world according to the many boys of Merrycliffe-on-Sea. She toys with them, then dumps them. But she'll never dump fashion-obsessed Franny. Nothing and no one can come between them. Not even tousle-haired rock god, Louis Allen, who Franny's been crushing on hard. Until Alice, bored with immature boys and jealous of Franny's new college friends, sets her sights on Louis. Suddenly, best friends are bitter rivals. Is winning Louis's heart worth more than their friendship? There's only one way for Franny to find out. It is fair to say I have been dying to get my hands on Sarra Manning's latest YA offering for a long time now and in doing so there is always the worry that I might get too high expectations and be disappointed. Therefore I am so so pleased to say that I adored it as much as I hoped I would. The worst girlfriend in the world is the story of best friends Franny and Alice. 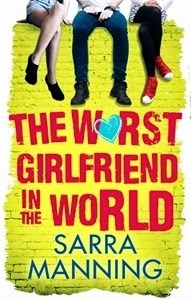 They've been friends since they were in nappies and been inseparable and never imagined anything could change that until Alice, who is infamous for being "the worst girlfriend in the world" for the way she treats boys, sets her fickle sights on Louis, the boy who Franny has fancied for ages. I loved several things about this book. The whole cast of characters were brilliantly done with each voice being unique and spot on in their teenage authenticity. Firstly I adored Franny and wished I had been more like her as a teen. Franny is cool without even trying, making her own clothes and dealing with all the rubbish life throws at her whilst working towards her ultimate dream of becoming a fashion designer. I found myself rooting for her from the first page and needing to know more about her. I also found her home life fascinating in the role reversal she was forced to play with her mother while her father was away from home. I don't think enough YA books deal with parents at all and this just added to making Franny feel that bit more real. Alice is a really interesting character. We all knew an Alice as a teen. That best friend whom we'd probably hate if we weren't friends with her but are because underneath it all there's just something about them that means you need them in your life. Alice is the kind of girl that I reckon would mellow with age but is so full of hormones at she often makes snap decisions that that can seem callous and sometimes cruel simply because she isn't thinking. For me that made Alice unlikeable for majority of the book but I must admit I did warm to her by the end. The storyline itself was just fab. I loved seeing the highs and lows of the friendship between the girls as Franny embarks on a new chapter in her life she she is starting to becoming the person she wants to be independent from Alice while still wanting that security of having her best friend to come back to. I adored that the girls went to the local indie club to dance around to a band they thought were musically so awful they had to wear earplugs but did so because the boys were pretty. We've all been there! The whole host of characters you meet are brilliant and I have a particular soft spot from Francis but also loved Steampunk obsessed Dora. All in all a book I thoroughly enjoyed and will be pushing into people's hands whenever I am in a bookshop for a long time to come.